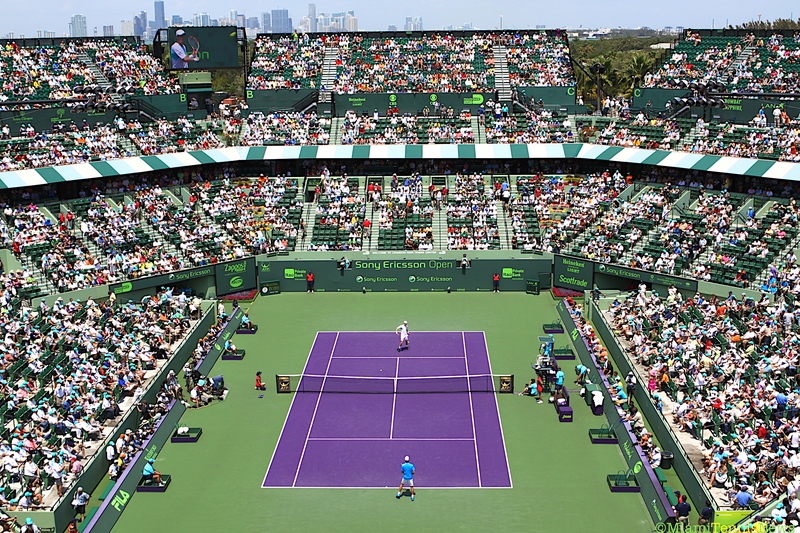 The next couple of weeks, tennis’ spotlight shifts to Miami as the ATP and WTA’s best players descend on Crandon Park to battle for the Sony Ericsson Open trophy. Leading the troops for the ATP will be this year’s Australian Open champion and world number one, Roger Federer. After an early exit at Indian Wells, Federer is looking to regain his form by ending a four year drought in South Florida. However, Federer’s task won’t be easy. Defending champion and 2010 Australian Open finalist, Andy Murray, will attempt to make it two in a row while Rafael Nadal after being sidelined by injuries for weeks will try to prevail for the first time in Miami. Also, not to be forgotten, Novak Djokovic, Sony’s 2008 victor and new world number two, who like Federer stumbled at Indian Wells will be ready to sizzle in the Miami heat. After advancing to the finals at Indian Wells, Andy Roddick, the champion in 2004, will see if he can continue his excellent play in the Magic City. All this bodes well for a very competitive tournament on the men side. Although reigning Australian Open champion and five time Sony winner, Serena Williams, will be absent due to injury, sister Venus, a three time vanquisher at Sony is hoping to capture glories of old. Venus last reached the finals in 2001. But, Victoria Azarenka, last year’s conqueror, will have plenty to say as she sets her eyes on a second straight Sony prize. In addition, Caroline Wozniacki, the 2009 U.S. Open finalist and Jelena Jankovic, 2008 Sony finalist, who squared off in the finals at Indian Wells will do their best to carry their momentum down to Sony. After a disastrous start to the season, former Sony winner and 2009 French Open champ Svetlana Kuznetsova is searching to reestablish her footing by doing well in Miami. Yet, the most intriguing players on the women side are Kim Clijsters and wildcard entrant Justine Henin. With both ladies fresh out of retirement and having quickly found their winning ways, the field can be said to be wide open. Along with singles, there will be plenty of doubles action to enjoy. After being derailed at Indian Wells in the first round, Mike and Bob Bryan will be seeking redemption while Daniel Nestor and Nenad Zimonjic who were disappointed in the finals in the desert by Marc Lopez and Nadal will be trying to make amends. Liezel Huber and Cara Black, the ladies’ top seed, hope that this will be the year they will breakthrough with their initial title in Miami. Qualification rounds start today. To purchase tickets, take a look at the draws and for more detailed information, click on sonyericssonopen.com. 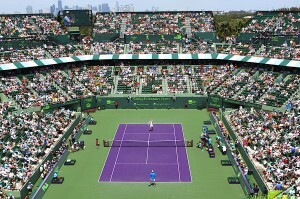 MiamiTennisNews.com will once again be on the grounds providing live daily coverage. 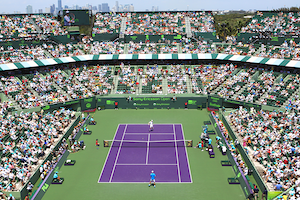 For up to the minute news, follow us on Twitter under the username MiamiTennisNews. Since surrendering the number one ranking, Serb Jelena Jankovic’s game has been careening backward. 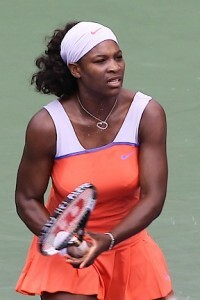 But, today, the 2008 U.S Open finalist showed that she will be a contender in New York. In the finals of Western & Southern Financial Group Open, a premier hardcourt tune up, Jankovic beat world number one Dinara Safina 6-4, 6-2 to pick up her second title of the year. After Safina held serve, a double fault gave her a break point. However, Jankovic yanked this opportunity away and managed to keep serve. Then, Jelena broke Safina at love for a 3-1 advantage which altered the complexion of the match. By effectively using her backhand, Jelena baited Safina into errors particularly on the forehand side and carried the set. In the second, Safina sent a backhand long to hand Jankovic double break point. Jelena capitalized when Dinara double faulted. After a love service game, Jankovic forced two backhand errors from Safina to widen her lead by a double break at 3-0. As a result of a double fault and backhand mistake by Jankovic, Safina regained one of the breaks. The next game, despite four double faults by Dinara, two of which were break points, Jelena was unable to capitalize. This potential swing in momentum was weathered, as Jankovic won her service game for a 4-2 margin. Subsequently, with aggressive returns and by deconstructing Safina’s forehand, Jankovic earned triple break point. After securing a 5-2 lead, Jankovic served cleanly to claim her biggest trophy of 2009.